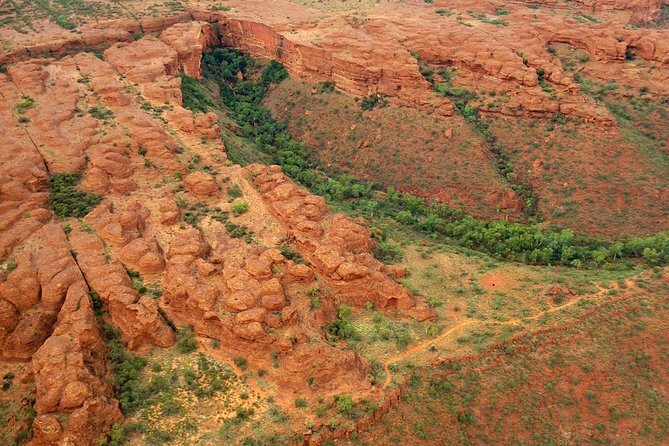 With amazing sheer cliff walls and surrounding valleys, Kings Canyon is an awe-inspiring landmark best appreciated from the air. You will also enjoy views of Uluru, Kata Tjuta and Lake Amadeus. Enjoy guaranteed window seating on your flight. Take off from Ayers Rock airport and fly the northern and western faces of both Uluru (Ayers Rock) and Kata Tjuta (The Olgas). Fly over the remains of an ancient coral reef on the way to Lake Amadeus, before descending down to conduct a low level pass following the inlet into the lake. Your pilot will then conduct some orbits at low level to witness the incredible patterns on the surface of the lake and the beautiful colors that make this one of the most breathtaking views in the area. As you climb, take in the 112-miles (180-kilometers) of the lake before departing for Kings Canyon. Enjoy the flight across the Australian outback and gain an appreciation of its vastness. Approach the George Gill Range and the opening of Kings Canyon lined with Ghost Gums. The pilot will point out the Lost City along the Canyon edge and the Garden of Eden waterhole located inside the canyon. Your local pilot knows all about Uluru and its surroundings and will provide you with expert commentary, so please feel free to ask as many questions as you like. Experience a view like no other! Every thing was perfect and the pilot Chrissy was the best pilot experienced with interesting information.